M&D STUDENTS WINS THE PRESELECTION TO THE 2014 NASA CHALLENGE! 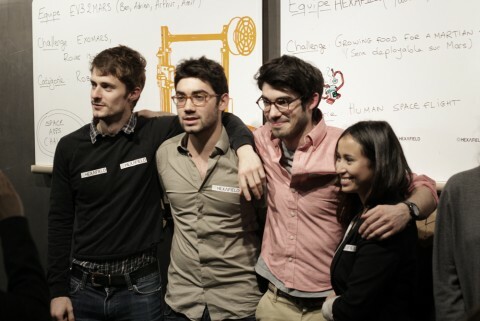 12-13 April 2014, “student seminar S6 Makers & Development (M & D) taught by Yasmine Abbas and seminar S5 Make taught by Marie Aquilino had the opportunity to participate in the hackathon organized by the NUMA (first space Co-working in Paris) and CNES . The event took place at fablab the Digital Crossroads 2 of the Cité des Sciences (with stunning views of the Geode!). Students are divided into three interdisciplinary teams to meet NASA challenges that republishes a series of challenges organized into five themes: robotics, technologies related to space, space travel, observation of asteroids and the planet earth. A team worked on the deflection of an asteroid, the other on creating a budget small satellite and the third generation of a deployable greenhouse on Mars. The educational goal was to immerse themselves in the world of a fablab pourproduire in one weekend a coherent concept in collaboration with people from different worlds and discussion with teachers from both seminars (coaches mobilized for the weekend) and robotics experts (including Olivier Grossat who spoke to ESA for a conference and workshops on 3D printers), computer and user experience. This is the public, visitors to the city of sciences and participants hackathon, which ultimately decided the two winning teams from the five who competed. Students were part of the ESA-teams HEXAFIELD Send “flowers” on Mars (the greenhouse on Mars) and SWARM EXPLORER (satellite budget)!